As we discussed in May, the National Marine Fisheries Service has responded to petitions to list both great and scalloped hammerheads under the Endangered Species Act, one of the most powerful conservation laws in the world. The IUCN Shark Specialist Group, an international team of experts, lists great hammerheads as Endangered on the IUCN Red List. Several long-term independent studies around the world (Australia and South Africa, the Mediterranean Sea, the Caribbean Sea) have noted rapid and severe declines in the populations of hammerhead sharks. The often-cited “Collapse and Conservation of Shark Populations in the Northwest Atlantic” said that “the trend in abundance is most striking for hammerhead sharks.” In short, while scientists and policy experts can reasonably debate how much they’ve declined or whether or not ESA protection is warranted, there is absolutely no doubt whatsoever that populations of this species (and many other species of sharks) have drastically declined in many parts of their range. I am a firm believer in participation in management policy from all stakeholders, particularly the fishermen who will be directly affected by any regulations resulting from an ESA listing. Additionally, fishermen know a great deal about the ocean, collaboration between fishermen and scientists is essential for research and effective policymaking, and at least one researcher that I know and respect has worked directly with this individual fisherman. However, giving equal coverage (and therefore implying equal validity) of these two quotes is both preposterous and counterproductive to the goal of accurate public understanding of the issue. One the one “side”, you have decades of research by international teams of experts using independent and diverse methods showing rapid and severe declines in shark populations around the world. On the other, you have someone whose job it is to lobby for the fishing industry saying “sharks are still there because I still see them sometimes”. If portraying the truth is more important than avoiding angry claims of “bias”, the journalist who wrote this piece should have pointed out that Oden’s claim that all shark populations are healthy is drastically out of step with worldwide scientific expert consensus. It is not my intention to demonize the writer of this article. He was, after all, one of very, very few journalists to address the ESA proposal for great hammerheads at all, and other than not putting the fishermen’s quote into proper context, he did a good job of explaining the situation, including alternative policies. In years serving on the Sun-Sentinel’s environmental beat, he’s covered past marine science and conservation topics very well. My intention is to point out that false balance is a complex issue with no clear solution. It is a problem with the overall media culture including editors, not with individual journalists. However, if we are to avoid Asimov’s “cult of ignorance….nurtured by the false notion that democracy means that ‘my ignorance is just as good as your knowledge,’ ” the first step is to be vigilant in searching for false balance of science and conservation topics in the media, and to call it out when we see it. Update: The journalist who wrote the original article has replied via e-mail to this post, and asked me to post his reply here. Thanks for the opportunity to respond. I’ll concede one of your points immediately: I think my article would have been improved with a general paragraph on the worldwide decline of sharks. I’ve done that often enough and should have here. It would have been completely appropriate after the fisherman’s comments to quote the IUCN or some authoritative study saying that great hammerheads are endangered worldwide. But I’m not sure you picked the right story for an an examination of false balance in the news media. I think the false perception of “equal validity” to two points of view comes not when a reporter quotes a scientist and then someone from the affected industry, in this case a fisherman. In those cases, the reader knows that one of the people quoted is a non-scientist with a financial stake in the outcome and can assess their comments accordingly. The false balance problem emerges when a reporter quotes a scientist representing one position and then casts about to find a scientist to quote in opposition, while ignoring the fact that the opposing scientist is an outlier, opposed by an overwhelming consensus in the scientific community (S. Fred Singer is the classic example on the global warming issue, but you could probably find examples with cigarettes, vaccinations and a few other issues.) This obviously misleads the reader. But I really don’t think that quoting a scientist and then quoting an industry advocate – whether from the oil industry or the fishing industry – gives “the perception of equal validity” to their points of view. On global warming, to stick with that example, I think it’s essential to cover the deniers – not as a scientific phenomenon but as a political one. As you point out with the fishermen, leaving them out would leave out an essential part of the reality of the issue, whether we like it or not, so long as their comments are framed correctly and they’re not portrayed as something that they’re not. Regarding the headline you preferred in Huffpost: I had reported in previous articles on the decline of great hammerheads and the proposal to list them. The news of the day was the reaction to the proposal, via the comments submitted to the National Marine Fisheries Service. So while some may prefer the Huffpost headline because it emphasizes the species’ decline, the headline that ran on the Sun-Sentinel version was a more precise account of the content of the article. A shortened version of this post was published as a letter to the editor to the South Florida Sun-Sentinel, and the author of the original article has been alerted about the post and invited to comment. *Regular readers and friends know that this particular shark scientist happens to be my adviser. This is actually unfortunately common in the international treaty arena; look for instance at CITES, where the notorious/nefarious Eugene Lapointe, former Secretary-general of that same treaty expelled by the UN due to his foggy dealings, turns up at Conferences of the Parties with self-appointed “experts” to counter any proposal for further trade restriction on endangered species. I suspect that in the case of fisheries, where solid data is less difficult to come by and even worse to interpret to lay decision-makers, the field is much more prone to this sort of scam. All we can do is to continue to promote sound scientific data AND the notion that one should err always in the side of caution when dealing with wild species harvests. Hi David, another great read! If we take a step back from our internal biases (I’m sure we nearly all shark lovers here! ), the article (http://articles.sun-sentinel.com/2013-07-02/news/fl-great-hammerhead-endangered-20130702_1_hammerhead-wildearth-guardians-neil-hammerschlag) has two quotes from people who the reader would assume to be experts (Neil Hammerschlag and Jeff Odin), two quotes from expert-sounding groups (Florida Fish and Wildlife Conservation Commission & Atlantic States Marine Fisheries Commission) and one ‘fact’ from someone who’s background isn’t given (Staci-Lee Sherwood). If anything, then, the least just comment on the page is the one from HER, and it’s pro-shark. Thanks for your thoughtful comment, Simon. The false balance here is subtle in what is otherwise a very good piece by someone who writes lots of very good pieces. It is still important, though. NMFS considers comments from the public in their deliberations, and many in the public get informed about the issue from newspapers like the Sun-Sentinel. In short, it matters that people know that many populations of sharks are severely declining. True indeed. This has always felt like one of the dilemmas/weaknesses of conservation science Vs business interest: scientists try to follow a code of ethics and diligent checking which means they can lose to people who are unscrupulously and loudly wrong, by being quietly and diligently correct. I suppose the cure here is for conservation-minded members of the public and not-directly-involved scientists to take the media to task when they’re guilty of such things. It will often be as easy as commenting on the page or emailing the article’s author or newspaper editor. Spread by social networking sites, it can be simple to quickly swarm on false or misleading info and redress the balance. I actually found the Sun-Sentinel/HuffPost article to be fairly well balanced but your criticism to be heavy handed. The “false balance” quote you focused in on is cherry picked, ignoring immediately preceding statements in opposition from the Florida Fish and Wildlife Conservation Commission and The Atlantic States Marine Fisheries Commission, which if my math is correct, represent 16 states. What category do you put them in? Ignorant, as in the included cartoon, or self-interested fishing industry lobbyists? You seem to argue let’s ignore those impacted by a given issue because they dare speak to another side, or are directly impacted by a “settled science” policy issue? Ah, but don’t worry because I’m wrapping my argument in the time honored tradition of appeal to authority. Your commentary is a call to replace “false balance” with no balance, which would give “settled science” the clearance to make public policy free of the “frustrating” voices of those impacted. Yikes! I’ll take giving voice to the other side any day over totalitarianism. I am by no means “ignoring those impacted by an issue”. I explicitly said “I am a firm believer in participation in management policy from all stakeholders, particularly the fishermen who will be directly affected by any regulations resulting from an ESA listing. Additionally, fishermen know a great deal about the ocean, collaboration between fishermen and scientists is essential for research and effective policymaking”. This is not a concern with “giving a voice to the other side”, nor is my argument “appeal to authority” or totalitarianism. This is “appeal to decades of data developed by international teams of experts”, which show that the fishermen quoted said something that was demonstrably and wildly incorrect. I don’t know him and have no reason to suspect he’s intentionally lying rather than just being unaware of the reality of the situation , but the journalist who wrote the piece knows the facts and knows that the fisehrmen’s quote is inconsistent with them. This should have been pointed out, as the journalist himself acknowledges. As someone completely ignorant of this issue, the financial stake of Jeff Oden is opaque from reading this article. For all I know, a “shark trip” might be a diving trip to view sharks. Google the organization, and you soon see the potential for massive conflict of interest. That is not clear from what is written without some other background knowledge. I understand your point but I think when it comes to widespread pelagic species, one point of view may be as valid as the other. Using your example, NOAA/NMFS is currently right in the middle of promulgating a new shark rule, and the only species of concern are dusky sharks (with some overfishing concerns about sandbar sharks). That would seem to indicate that hammerheads are not an issue in U.S. waters, So in the case of the article cited, the fisherman’s point of view, i.e. that there are plenty of sharks around off off NC, may indeed be true despite the scientific consensus that sharks are in trouble in other parts of the world. It isn’t though. We’re not talking about a survey of what every fisherman off North Carolina said they saw compared with similar surveys over a series of years. We’re talking about one professional advocate saying that he “knows” that shark populations are healthy. So you’re saying that because NMFS issued a rule focused on one species, they can’t be concerned about any other species? That’s not how policymaking works. It also ignores the point of the original article, which is a new NMFS proposal to list hammerheads under the Endangered Species Act. If NMFS isn’t making rules about hammerheads as you claim, why the NMFS rule about hammerheads? Populations of some species are doing fine. Populations of hammerheads and some other speceis are not. Oden’s quote “hammerheads and all other sharks are healthy” is wildly out of step with everything that’s known about shark population status. The NMFS rules is about all pelagic and coastal shark species, have you read it? Further, NMFS has not proposed “to list hammerheads under the Endangered Species Act.” they are responding to a third party petition to list hammerheads under the ESA. Do you really understand how all this bureaucratic BS works? Anyway, my point is, and remains that you can’t extrapolate generic statements (or studies) about a worldwide distribution of a pelagic species, to include all subpopulations of the species. Some subpopulations may be fine while others are suffering. We (the fishery management people) have been down this road many times before. fishermen provide observations, catch figures, real time research opportunities. Scientists have not (almost without exception) had the tinniest amount of observation time at sea compared to fishfolk. In marine science scientists have chosen not to believe fishermen at all for the last 20 or so years and so are devoid of what they consider credible observations, especially historical observations. Legally fishermen are not ‘qualified’ and their words and observations have no merit in a court of law. Socially they are seen as the culprits in over-fishing, a non word that has no actual definition and serves simply attributes all variations in fish populations to the act of commercial and recreational fishing. Fisheries science is weak too, without the benefit of observations. It is often reliant on models informed by mathematical calculations that too often contain such error as to make them little more than guesses, especially when combined with dozens or even hundreds of interacting assumptions with the use of calculus. Journalists now also have to balance stories, giving ‘both sides’ excluding subtlties and seeing new paper readership collapse. With fisheries there are just two players in this game – fishermen and scientists/NGOs – so it will remain as NGOs can only be informed by science to be credible. 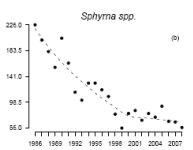 When the decline in fish is due to habitat loss, chemical pollution, diversion of stream flow, blockage of stream flow passage, eutrophication etc. These environmental factors can neither be taken into account in stock assessment in a way that identifies are not identified as a significant problem, compared to fishing, within fisheries science or management. Nothing that you’ve said here changes the fact that the fishermen’s quote in this article (that hammerhead and all other shark populations are healthy) is wildly out of step with what dozens of scientists and technical experts have reported around the world using a variety of independent methods, including fisheries-dependent catch data. I have not usually defended scientists – much to the contrary – but in this case I think the issue is very clear. The difference is between fisherfolk hearsay or “intuitive” perceptions, such as this absurd claim about “healthy” hammerhead shark populations, and the accepted methodology of Science through standardized observation and data collection. If there´s a doubt as to which one is more reliable, than I suspect the media (or anyone else) has a serious mental problem! Hammerhead sharks do form massive aggregations from time to time. It is reasonable for any observer to see these and think that this indicates a healthy population. Rather than attacking the observer and the journalist who reported the observation it would be better to explain that observation in the context of total hammerhead populations. The ecology of the actual species involved, their range and where and when they are caught.- the state and pressure on their nursery grounds wouldn’t it? As far as I know this species is not a targeted fishery so perhaps you could seek to better explain the nature of the biology of this species or group of species of fish, the history of the fisheries in which it was landed etc. Fishermen in Australia and elsewhere in the world pay for a major portion of this sort of research.and to estimate changes to world populations of any species is, I am sure you would agree, a big call. So there must be some amazing research to back it up and if that was accessible it would benefit all and help develop management that would benefit scalloped hammerheads. Just out of personal interest in sharks I would love to access this research. Has their been a documentary made based on it? Fishermen from Gladstone Queensland initiated and paid for good scientists to undertake research into the effects of dumping toxic dredge spoil that has finally resulted in the banning of dumping all dredge spoil in the Great Barrier Reef Marine Park – so we can all work better together if we are more respectful of each other – don’t you agree? Hya Bob, and thanks for the reply. It would be exhaustive to list all scientific sources in relation to hammerhead declines but some of the recent literature data and further listings can be found here: http://www.cites.org/eng/cop/16/prop/E-CoP16-Prop-43.pdf. Also the IUCN Red List sections for hammerheads have plenty of information and lists of literature cited: see for instance the entry for scalloped hammerhead at http://www.iucnredlist.org/details/39385/0. I don´t deny at all that fishermen can make valuable contributions for conservation and that eventually some even pay for research and management – which they should, as direct users of a shared public resource. But mostly it´s ALL of us who pay for it – in more than money, if the management goes wrong! Regards. With respect this science is not without it problems and limitations and clearly needs more work. The stock assessment information provided for this listing for possibly other than the USA are little more than guess based on observations – many from fishermen. It does identify discreet stocks. Perhaps there was more that could have been provided. There has been a large increase in the illegal, unregulated and unreported (IUU) fishing in northern Australia recently. Hammerheads are known to feature in the catches, and are suspected targets for their large valuable fins, although no specific data are available. Further study is urgently required to determine the status of S. lewini in this region. Actually this was wrong – however understandably. The WWF a couple of years ago released figures on shark fins based on AQIS gov figures showing increasing export sales. Upon investigation it turns out that these fins were recovered from the legal shark fishery – the southern shark fishery in Australia and from the removal of fins from shark imported from South Africa, New Zealand and possibly Australia for domestic shark flesh consumption. As that examination was not by a scientist it has been ignored – to date.These species include Galeus (sp soupfin for you) and Mustilus, sp (gummy shark to us) but with weak laws on substitution others like hammerheads could have been in the mix. The USA had a terrible shark catch data base last I looked in 2001. There are less than half a dozen boats that work out of the Northern Territory that target black tip sharks that may l;and the very occasional hammerhead. With closures of 90% of Australia’s estuarine and coastal fisheries over the last 20 years – and similar closures elsewhere – raw catch data is pretty meaningless scientifically. It is not just the catch per unit effort when that unit of effort is one ‘fishing shot’ – which David rightly points out is not indicative of local stocks (range?). The only, as far as i know, method for analyzing declining or variable fleet catches of full time fishing boat per decade that enable comparative data to be used far more accurately. These calculations also enable the comparison of effort and changes in efficiency to be accurately identified and figures adjusted accordingly. Anyway, what is not established by the IUCN is the mortality of scalloped hammerheads from other natural sources (other sharks such as Notorynchus sp. specialise in hunting young of other species of shark) and human induced ones. I would also like to know the location and state of their nursery grounds. In Australia we have had extensive disease in sharks associated with dredging of toxic spoil and dumping it on the Great Barrier Reef – the ban on which is not quite legislated yet as I discovered this morning. Science is special because it changes over time. Stopping people catching scalloped hammerheads in a small number of western jurisdictions does neither identify nor solve all the problems facing this and other species – so as the science focuses on the regional differences in abundance of this species so too can management change. However, if fishing is indeed a threat to this species actual survival and their numbers are declining then research to compare fished and non fished sites with controls is needed urgently.to discern the actual impact of fishing. It may be something else, like dredging and disease, in various locations that can be addressed, It may be fishing – re-enforcing management measures to date. The most useful part of that link to you (the article itself is a summary of peer-reviewed research) may be the “References” tab, which lists all the peer-reviewed research that went into the article. Many of the articles are freely available online, search the title on Google Scholar. If any aren’t let me know and I can send them to you. There are dozens. Hi Dave, thanks for that. I presume you have read a good selection. From what you have read were there any that dealt with the veracity and error in the data compiled, or factors other than fishing that impact scalloped hammerheads populations in any of their range? What were the sources of data generally used to show a decline as the graph you used (from the Australian research?)? However, back to the issue at hand, could you and your colleagues possibly more directly engage with the fishermen who were quoted as making the observation – perhaps through the journalist? However annoying it may be when research is used to impact people livelihoods and the economies of small port towns in regard to fisheries – whether people actually ‘believe it’ or not – it is surely obligate for marine scientist to attempt to engage with them and explain the science that impacts them – isn’t it? I’m not sure what your point is about other threats to hammerheads? The single greatest threat facing hammerheads in most parts of their range is fishing, typically bycatch but there are some directed fisheries. Even if there are other threats, we should still reduce fishing pressure for hammerheads because fishing is a major threat and populations have greatly declined. The sources of data are varied- fisheries independent scientific population surveys , fisheries dependent sampling based on reported catches of fishermen and of observers,, SCUBA diver surveys, beach nets, market analyses, etc. They all tell the exact same story, of a severe and rapid population decline in many parts of the range. Researchers, including my lab and I, often engage with fishermen. I don’t know this particular fisherman and we’re not in the same state, so I’ll leave that to locals. Thanks for a thoughtful discussion, and please let me know if there’s anything I can answer for you.